Defying limits, the audacious 1 Million fragrance evokes every masculine fantasy and desire, while exuding a self-assured, intelligent spirit. This fragrance is for the confident man, one who is not afraid to show who he really is. Its bottle, shaped like a gold bar, gives it an almost mystical power, captivating all who gaze upon it with envious eyes. 1 Million symbolizes the reaffirmation of a certain kind of virility, one that is drawn towards the pursuit of pleasure, fast cars, beautiful girls, and games of seduction. 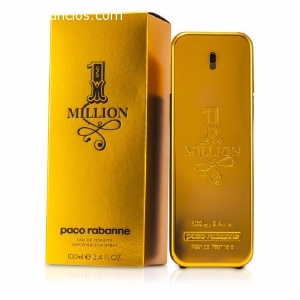 Experience Paco Rabanne 1 Million with this 1.7 oz Eau de Toilette.